Som uppgiftsgivare och mentor fungerar Hanna Råst. Retur av tävlingsbidragen senast 9.12. mennessä. Offentliggörande av deltagarna som går vidare 14.12. Vad inspirerade dig till att ta fotografiet? Vad är din inspirationskälla när du skapar en bild? Fotografering tar ofta sin inspiration från något annat än ett fotografi. Vetenskapliga källor som biologi, filosofi, geografi och kemi eller annan kunskap kan utgöra bakgrunden till ett foto. Ibland är det någon annan konstform såsom litteratur, musik, film eller teater. Det intressanta är hur man förvandlar något till ett visuellt uttryck. Hur skulle ett ljud eller en dikt se ut på bild? Hur kan ett fotografi reflektera till exempel psykologi, estetik, eller vår uppfattning av naturen? Och hur kan man förkroppsliga en rörelse, något som ett fotografi i princip saknar? Välj en inspirationskälla som är viktig, reflekterande eller provocerande för dig. Det kan vara en konstnärlig källa, exempelvis en bok eller ett musikstycke, en film, målning, skulptur eller teaterföreställning. Utgångspunkten kan också vara vetenskaplig, såsom ett biologiskt, historiskt eller psykologiskt tema. Förutom de ovan nämnda, kan temat även vara ett minne, en historia som du har hört eller en undersökning. Välj en inspirationskälla och skapa ett foto, ett bildpar eller en bildserie med max. tre bilder. Om du vill kan du också luta dig mot en teori som du ger ett bildmässigt ansikte. Om du väljer att skapa ett bildpar eller bildserie, bör du vara uppmärksam på bildvalens betydelse, bildernas ordningsföljd och hur de kommunicerar med varandra. Fundera noga på hur du omvandlar din valda källa till ett fotografi. Utmana dig själv, och försök inte bara reproducera det du har sett, hört eller läst. Gör ett oberoende konstverk som absorberar något annat utanför fotograferingen. Notera att slutresultatet kan också vara ett collage, men det måste vara baserat på fotografier. What inspires you to take a photograph? What is the source of inspiration for your image-making? The field of photography is often influenced by something else than photography. Scientific sources such as biology, philosophy and chemistry, or other sources of knowledge might be found at the background of a photographic work. Sometimes it's another form of art such as literature, film, a theatre play or music. The interesting question is how to turn that inspiration into visual expression. How would a sound, poem or a chemical formula look like when pictured? How can photography reflect psychology, aesthetics or our perception of nature? How are you able to capture movement that still image itself lacks, or an atmosphere that some movie has? Choose a source of inspiration and create a photograph, diptych or triptych (max. 3 images) based on it. Choose something that is important to you, amuses you, puzzles or provokes you. It might be a book, a song, a philosophical theory, biological research, a theatre play, a poem, dance (movement), a story you have heard, a memory, an investigation etc. In case you are creating a diptych or triptych (or series of 3 images) pay attention to the image selections and the order of the images: that is, how they interact with each other. Carefully consider how you change the chosen source to an image. Try not to reproduce what you've seen, heard or read. Challenge yourself and create an independent work of art that absorbs something other into itself. Note: the result can be also collage, but it has to be based on photos. "It is challenging to represent something invisible in visual form. Victorian scrap reliefs of angels are a fresh point of view, and I like the staged setting of the images. 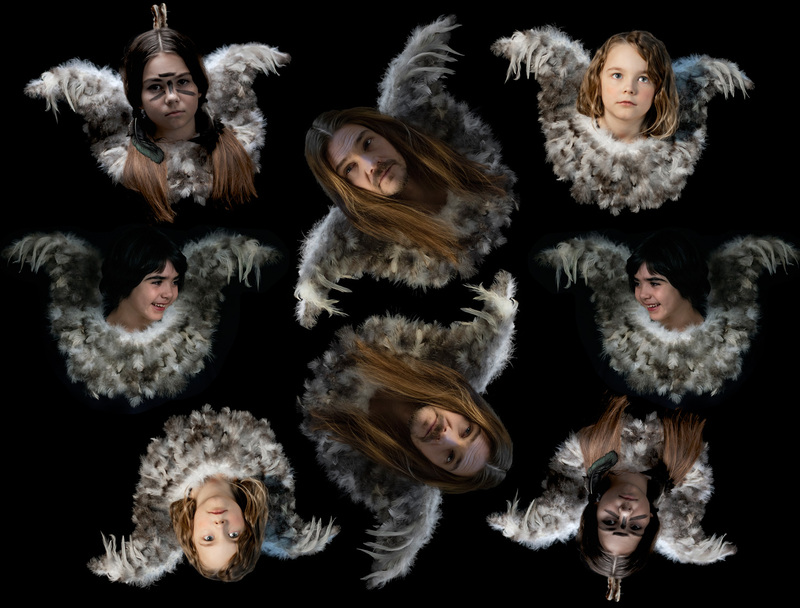 What would be interesting thought, would be to expand the idea even further: if the idea of angels expands across cultures and beings, could they actually be a combination of animals and humans, or even other objects too?" "The inspiration theme “fear” resonates well with the visual content of the image. 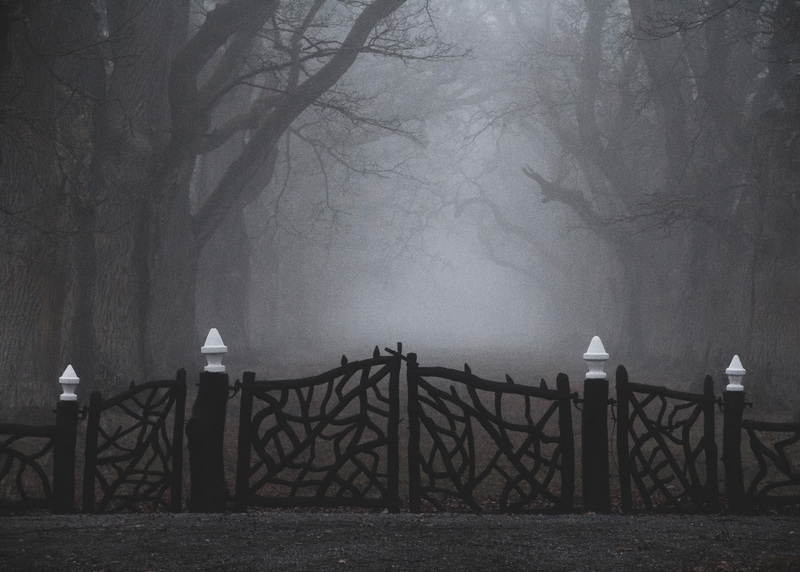 Familiar horror imagery can be found from the elements: foggy forest, a spiderweb-like gate, gloomy colors. The main subject, the gate, blocks our way and hinges advancing further, drawing the lines between different states of being afraid. Very powerful image." 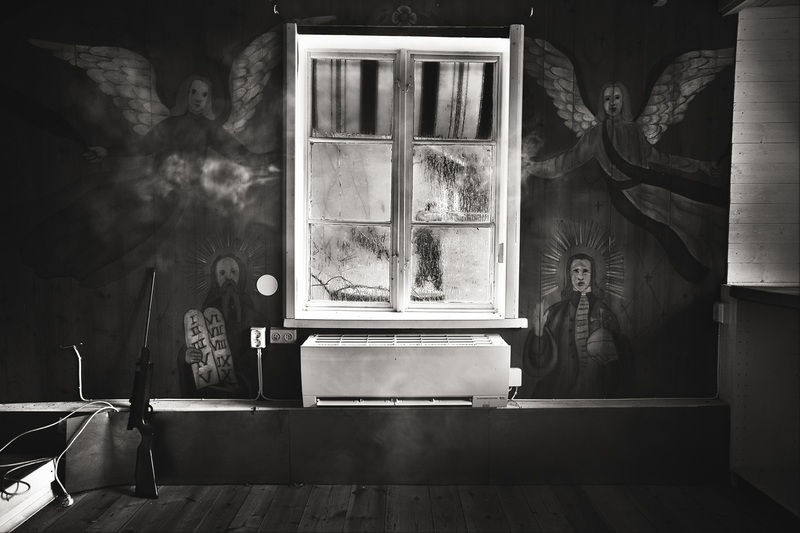 "The image combines violence, beliefs and religion in an interesting way, being almost secret when the whole scenario is in an abandoned or unused house, condensation on windows blocking the view to the outside world. There’s a strange sense of tranquility in the setting, but a danger definitely looms in the background." "We are thrown straight into noise, beat and flashing lights. 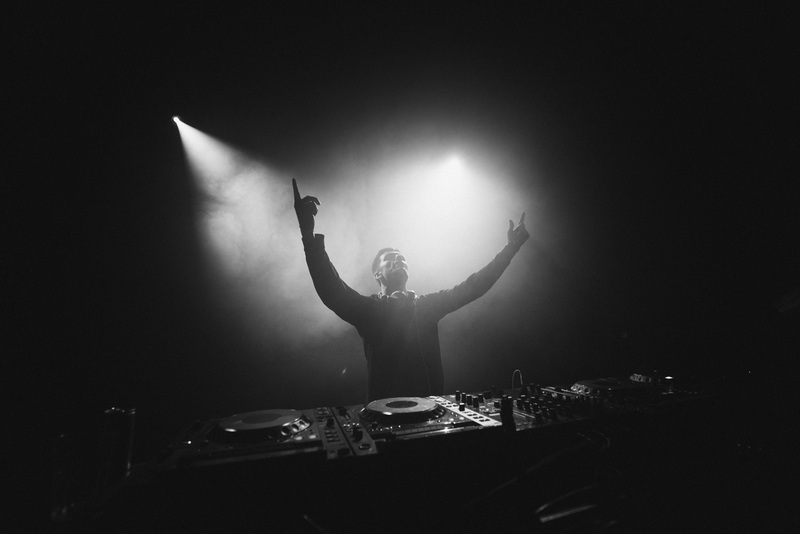 Here the DJ is the king, operating the sound and lifting the mood. The darkness in this picture is comforting, giving space for the music to start playing in our minds. Simple, but effective." "The image allows many interpretations: climate change, the everyday routines of working life, repetition. 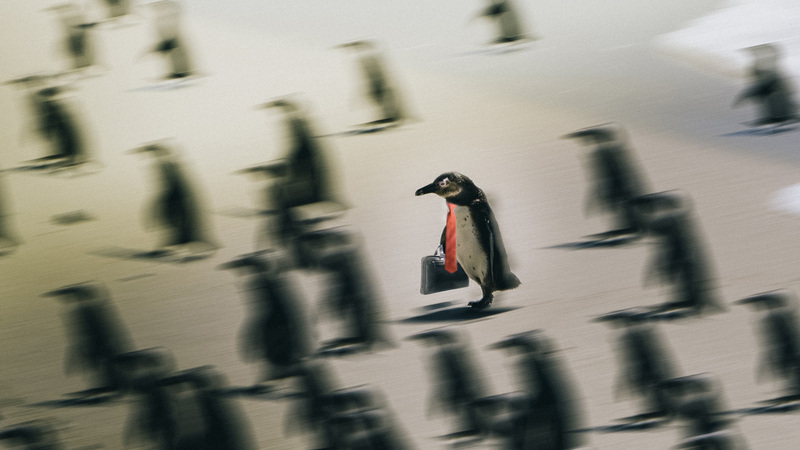 The penguin, some of them being endangered species, highlights global warming and how that forces us to migrate. But being a worker it gives an exhausting feeling to it as well. A very thought-provoking image!" 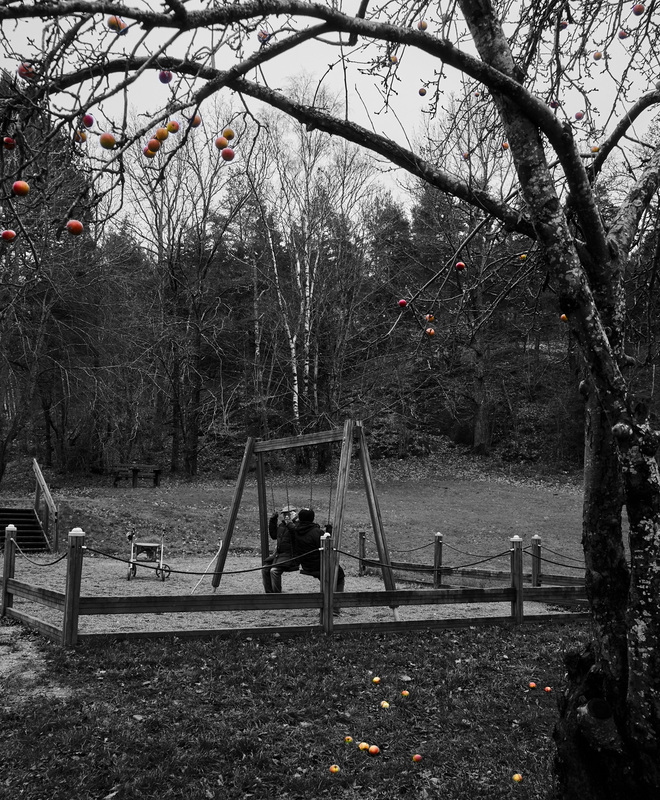 "The image shows two elderly persons swinging and laughing on the playground. I like the idea of life where one never grows old. However, I feel that the subjects are quite far away making it hard to grasp the idea well. I would prefer going closer and involving more of the youthful moment they have."